One of four power supply modules can be selected for CX1010 / CX1020 systems. The power supply of all other system components is ensured via the internal PC/104 bus, no separate supply lines are required. However, the CX1100 components offer further important characteristics that go beyond a pure power supply: an integrated NOVRAM enables the fail-safe storage of process data, an LC display with two lines of 16 characters each is used for displaying system and user messages. 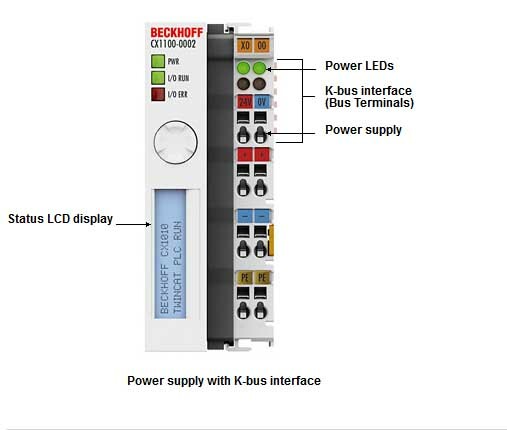 Local I/O signals are connected via the CX1100-0002 power supply variant, to which all Beckhoff Bus Terminals (KLxxxx) can be connected, or via CX1100-0003, which in addition to the Bus Terminals enables the connection of Extension Box IExxxx type Beckhoff Fieldbus Box modules. The option to connect Bus Terminals or Fieldbus Box modules creates a control system with a very variable, expandable I/O level with large signal variety. The I/O data are stored in a DPRAM, which is accessible by the CPU via the system bus. All EtherCAT Terminals (ELxxxx) can be connected via the CX1100-0004 power supply unit. With the CX1100-0004 the I/O data are stored directly in the main memory of the CPU, a DPRAM is no longer required. The power supplies of the CX system can be changed in the field.